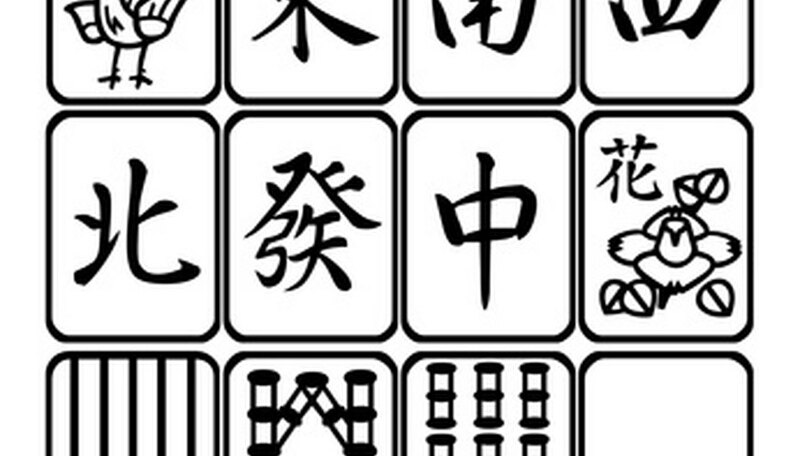 Mahjong looks intimidating, but it is actually quite simple and similar to rummy. Following some simple step-by-step instructions you should be playing mahjong in no time. Set a point limit. This will roughly determine the length of the game. Games are generally played to 1,000 points. 1,500 will make a longer game wile 500 will make a shorter game. Designate players in accordance with compass directions (North, South, East, West). East will be the first dealer. Shuffle the tiles and put them face down in a square structure that is two tiles high and one tile deep. The sides will be 18 tiles long if you are playing with Flowers and Seasons, and 17 if you are not. The total number of tiles will be 144 and 136, respectively. Draw tiles from the wall, with each player drawing from her section. Each player takes four tiles at a time until everyone has 12. East then takes one tile from the end of his wall. The player to his right takes the tile under that, the next player takes the next tile in the dealer's wall, and so on until East has 14 tiles and the other players have 13. Set tiles in front of each player so that so that each player can only see his own tiles. Organize them by their suit and number. Try to get a complete hand, which is four groups and one pair. Groups are made of three tiles, and must either be matching or sequential. Discard a tile if you are the dealer and you have not already won the game based on the original tiles you drew. Take the discard to make a sequential run only if it has been placed by the person to your right. Take a discard to make a group of three whenever you see it, regardless of who placed it. Only take the immediate discard. Take a winning tile whenever it appears, regardless whether it is part of a triplet or sequential. Show your completed group whenever you pick up a discard. Draw from the wall whenever the discard is not helpful to you. Award a point to whoever wins. Award whoever gets Mah-Jong an extra point for each triplet made of Dragons or Winds. Award anyone with a triplet of Dragons or Winds an extra point for each one. This is optional, as it allows someone to win without getting Mah-Jong and thus affects the game's strategy. Use these simple rules before you move on to advanced strategy.